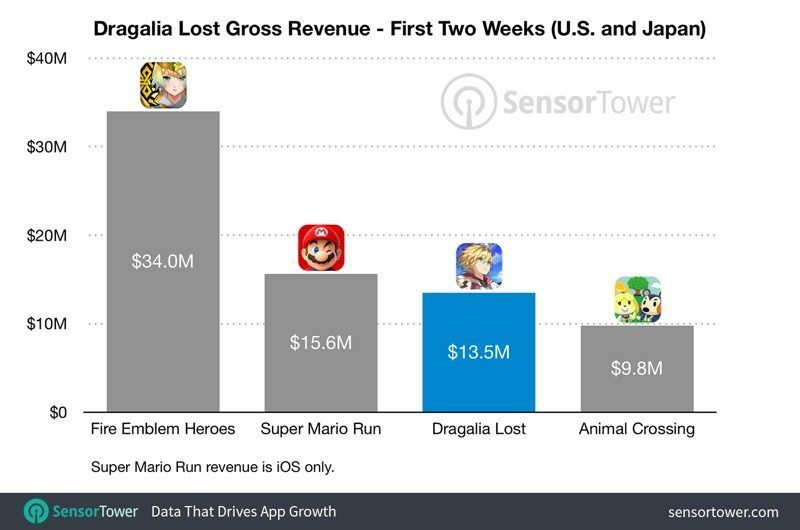 In the two weeks following the launch of Dragalia Lost, Nintendo's newest title, the game has earned $16 million in revenue from the iOS App Store and Google Play, according to estimates from app analytics site Sensor Tower. $13.5 million of the $16 million in revenue has come from Japan and the United States, with the game now ranking third when it comes to revenue earned by Nintendo mobile titles. During the first two weeks of availability, Fire Emblem Heroes earned $34 million, Super Mario Run earned $15.6 million, and Animal Crossing earned $9.8 million. Dragalia Lost, unsurprisingly, is performing best in Japan. 69 percent of total revenue has come from Japan, while 16 percent has come from the United States. The remaining 15 percent has come from Hong Kong, Taiwan, and Macau. Dragalia Lost is the 19th most popular iOS app in Japan at the current time, and the number 512th most popular app in Japan. In terms of revenue, it is ranked number 10 in Japan and number 62 in the United States. Nintendo released Dragalia Lost two weeks ago on Thursday, September 27. The game is an original swipe-based action RPG developed in partnership with Cygames. Dragalia Lost tasks players with conquering their enemies using powerful attacks and special skills, with players able to control characters who can transform into dragons to unleash their power on enemies. In addition to battling monsters, players will also need to develop a holy citadel for dragon training. Limited time multiplayer raid battles are available for up to three players online, and an internet connection is required to play. Like most of Nintendo's recent titles, Dragalia Lost is free to play and supported through in-app purchases. For a second I wondered how a game could have lost $16 Million in two weeks. What that heck does this mean? Anybody know? Still hated the freemium business model! The trailer for the game manages to show zero gameplay. They are everywhere. Also GameStop and BestBuy have free shipping. I just picked up another Super Nintendo Classic and saw NES classics right with it at a Target too. Yep. Specifically, the US, Japan, Hong Kong, and Macau. I think Taiwan as well. Yes it is available in Taiwan and now one of the most popular mobile games. Not only does this sentence not make sense, the numbers themselves don’t offer meaning unless you follow app ranking data. It’s not well written, but it does make sense. In Japan, it’s the 19th most popular iOS app. In Japan, out of all apps (I assume across all systems) it’s the 512th most popular app. They’re just boring stats. Take them or leave them.